Jonathan Bentley has been an editorial illustrator for Australia’s Courier Mail for over ten years, and he has illustrated twenty books for children. Little Big is his debut as a children’s book author, and today he recounts what and how he learned in his first authorial endeavor. Little Big is a story about a little boy who is trying to make sense of his place in a big world. His older, bigger brother goes to school and can ride a bike, open the cookie jar, and stay up later. So the little boy imagines all the things he could do if he was much bigger even than his brother. Along the way he discovers something about being little. 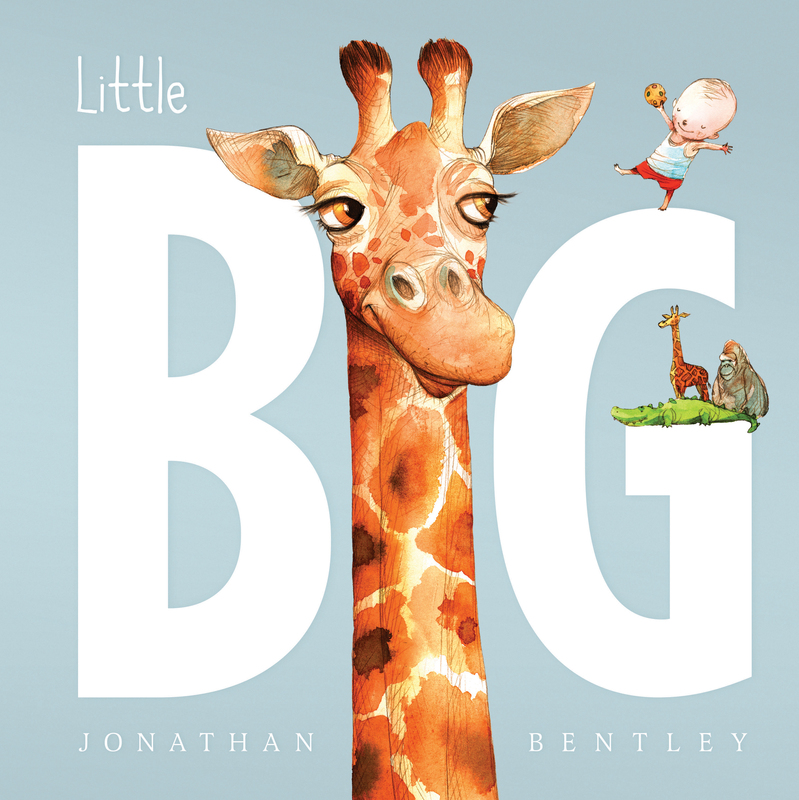 I am very proud of Little Big because even though I had illustrated many books before, I had never written one before this. Normally, I am given the story and then I have to think of the way I would like to illustrate it. In this case, I actually started with some visual ideas, things I liked drawing, like animals and trees and children. I did lots of little rough drawings, and then I started to think of ways to make sense of them. Slowly an idea for Little Big grew. At this stage I submitted drawings and words to my publisher, but really it was only a shell of an idea; it needed more heart to make it have a sense of reality, something that my little readers could perhaps relate to. I wanted the reader to feel and care for the little boy, perhaps to understand what he might be trying to explore about himself and his world. I remember clearly being in awe of my older brother when I was little. Everything about him seemed cool: his clothes, his haircut, even the music he listened to. They were very real feelings, and it was easy for me to look at myself and feel a little not-so-cool. I wanted to bring all of that to life in my book. I knew I wanted it to be about a little boy imagining how great it would be to be as big as certain animals. In the end I chose a giraffe because he had long legs to run up a hill, a gorilla because he had hands big enough to open the cookie jar, and a crocodile because his mouth was big enough to tell his big brother to go to bed. Three wonderful animals to draw, and what fun I had drawing them! Writing the final words however, was difficult — but I knew it would be. I have grown an appreciation over many years for the authors whom I have worked with. They make writing seem simple, but it’s clearly not. Tying the pictures and words together in a meaningful way was a real challenge. In the end, I wrote and illustrated a story that I thought was fun and that I would have liked to read when I was little, one full of adventure and discovery. I hope children enjoy it and deem it worthy of a place on their bookshelf.